The San Diego Regional Bike and Pedestrian Counter Network is one of the largest in the country. The network was initially funded by a grant from the Centers for Disease Control and Prevention and is a collaborative effort between SANDAG, San Diego State University, and the County of San Diego Health and Human Services Agency. Across 15 jurisdictions in the San Diego region, 54 counters have been installed at 37 sites. Placement of counters was determined in consideration of regional bikeways in the 2010 Regional Bike Plan, smart growth place types using the Regional Smart Growth Concept Map, and socioeconomic factors. Data is collected every 15 minutes and uploaded daily to the Eco-Counter website. To allow for a robust analysis of biking and walking behaviors, there are three types of counters in operation â€“ some count people biking, others count people walking, and some count both people walking and biking. SANDAG is currently exploring how this data could support ongoing transportation performance monitoring efforts. The initial network was installed in 2012 and is in the early stages of development. Daily maintenance and management of the network is needed to make sure counters are properly functioning and data is as accurate as possible. Although counters are strategically placed, they do not count every biking and walking trip made in the region. 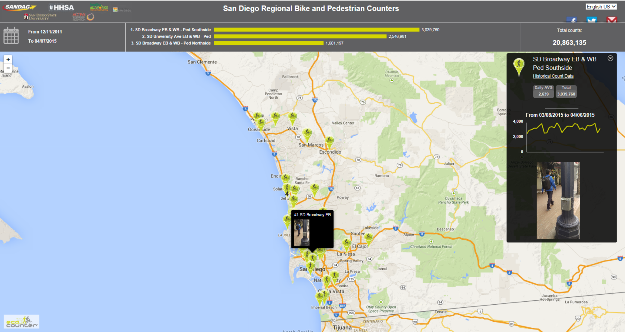 View the counter locations and data on the San Diego Regional Bike and Pedestrian Counter Network website or click on the picture below. SANDAG is not responsible for the accuracy or correctness of the data. In no event shall SANDAG become liable to users of these data, or any other party, for any loss or damages, consequential or otherwise, including but not limited to time, money, or goodwill, arising from the use, operation or modification of the data. In using these data, users further agree to indemnify, defend, and hold harmless SANDAG for any and all liability of any nature arising out of or resulting from the lack of accuracy or correctness of the data, or the use of the data.